TATARUS, Margareta (2017) From library volunteers to community engagers. Paper presented at: IFLA WLIC 2017 – Wrocław, Poland – Libraries. Solidarity. Society. in Session 112 - Poster Sessions. As democracy is growing roots in the post-communist Romanian society, lack of community cohesion is palpable at local level. After decades of mandatory voluntarism, community volunteering is frail. 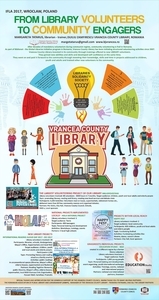 This poster presents how a public library managed to actively engage its volunteers in the life of the whole community. Starting from 2014, Vrancea Public Library made calls for volunteers to help promote reading and the library. Few people of all ages, with no volunteer experience, responded. The library offered them over 100 hours of free training in communications, teamwork, digital storytelling, improvisation and public speaking, personal development, and event organization. Volunteers became enthusiastic. Their personal knowledge paired with librarians’ experience as trainers and the library’s interest in being at the heart of the community, created the synergy for a grassroots community change. Three years later the city of Focsani has 50 such trained volunteers that got engaged in over 20 community projects out of which only 3 involved the public library. 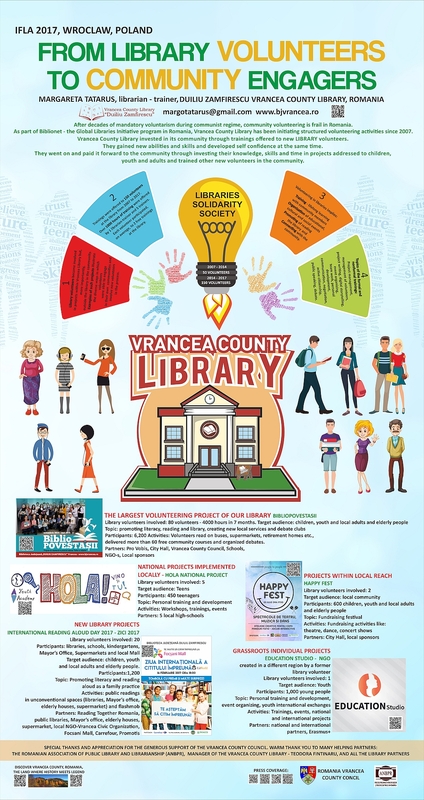 This poster illustrates the variety of activities that volunteers did through images and provides an interactive pop-up option for viewers to reflect on how can libraries enhance community engagement. IFLA WLIC 2017 – Wrocław, Poland – Libraries. Solidarity. Society.